Let me begin this post by saying that I don't like sweet potatoes. Baked sweet potato fries are okay, but anything else made with a sweet potato just doesn't appeal. So, when I saw this recipe I was hesitant to make it. But I decided to plunge ahead with it, mainly because I have probably 20lbs. of sweet potatoes in my pantry. And I figured if it turned out we didn't like it we could always have ice cream for dinner. Let's see what we've got. 1. Mix milk and muffin mix in bowl until well combined. Meanwhile, heat butter in large Dutch oven over medium heat until foaming. Add onion and cook until softened, about 8 minutes. Stir in garlic, cumin, and oregano and cook until fragrant, about 30 seconds. Add broth, chicken, and sweet potatoes. Bring to boil, reduce heat, and simmer until sweet potatoes are just tender, about 8 minutes. Verdict: Delish! 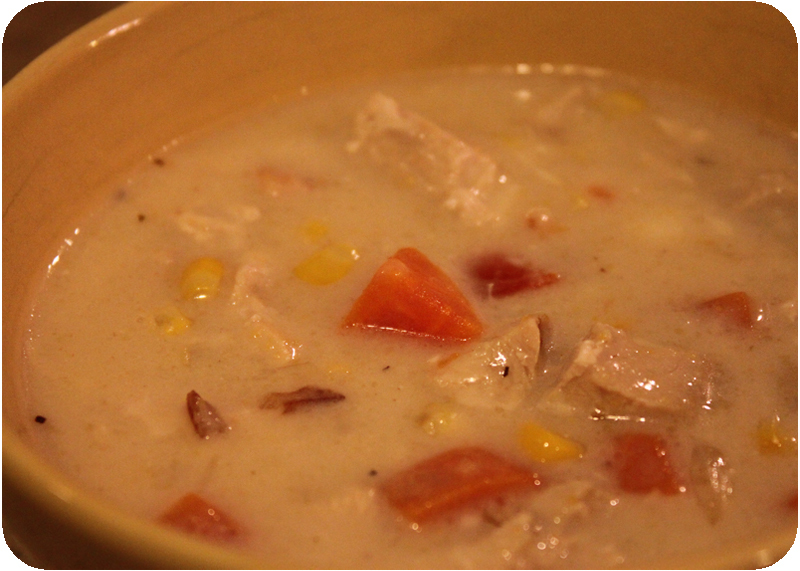 The sweet potatoes actually made this chowder. Their texture and (now) subtle sweetness was just right! This is a recipe I'll be reaching for again come fall and winter.